Imagine these situations: Your or a loved one is driving on a lone country road that's dark and desolate. You know in an instant that something's wrong. Controlling the vehicle becomes increasingly difficult and you ease the car to the side of the road. Getting out, you see that the left rear tire is flat. Have your ever had the experience of running out of gas or having a dead car battery? If you have a cellular phone and an account with the Auto Club help is only a phone call away. If you’re not that fortunate you could be faced with having to hail a passing motorist or spend a night in your car. That is, unless you have a well-stocked vehicle with the AA Communications 911 emergency phone and an auto emergency kit in the trunk of your car. When it comes to commuting or traveling any lengthy distance, an auto emergency kit can mean the difference between getting back on the road or being stuck for a long period of time. In many cases the personal emergency does not require a 911 call, the auto emergency kit allows you to help yourself. 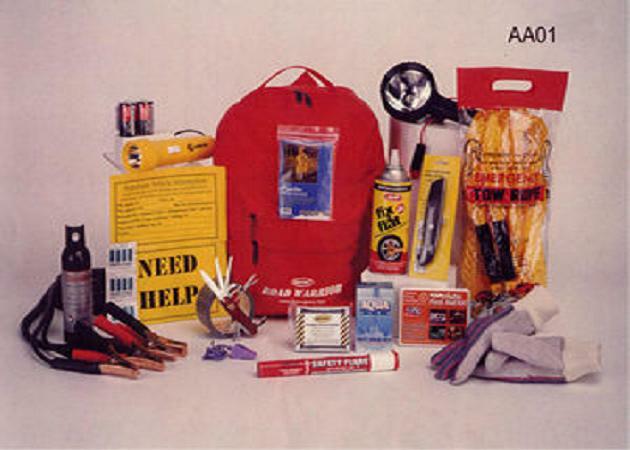 An auto emergency kit is the one item that every car or truck should have; yet most of us never carry any of the basic items to help us get back on the road quickly and safely. Automobile Emergency Light - Uses vehicle battery for power. Jumper Cables- These 12 foot cables are made of heavy duty 10 gauge rubber and copper. 31 piece First Aid Kit- Contains Band-Aids, Aspirin, Sting Relief Pad, First Aid Instructions and more. Flashlight w/Batteries - This "D" size flashlight comes with 2 batteries. Before you actually use your kit in an emergency situation, take some time to familiarize yourself with the items you've collected and how to use them properly. Also remember that the most important item is your own good judgment - stopping to change a tire in the high-speed lane is only an accident waiting to happen. Unfortunately, there isn't "one tool for all roadside emergency needs." But with a little planning and a small amount of trunk space, an auto emergency roadside kit can often save the day. 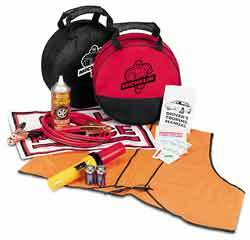 The auto emergency kits are the utmost in road survival that are made of practical components that will aid you to reach for the nearest help, or sustain you until help arrives. You can drive with confidence. 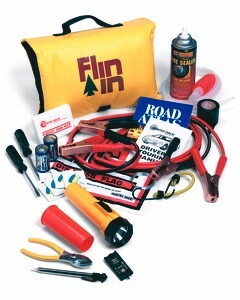 It contains an assortment of different items to handle nearly any road emergency you might come across. Every vehicle on the road must have one. A break down is considered to be one of the worst time wasting experiences. 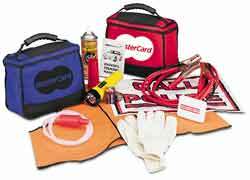 Avoid wasting time, order your Auto Emergency Kit today. 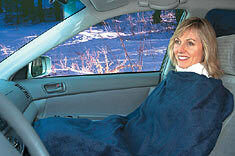 Tired of road-trip disagreements about how high to turn on the car heater? Then put an end to those disputes with a 12V Electric Travel Blanket! 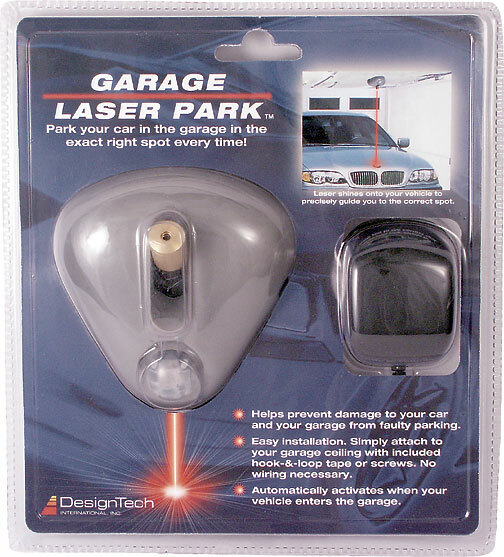 Order Now And Get A Free Glove Box Flashlight With Batteries! 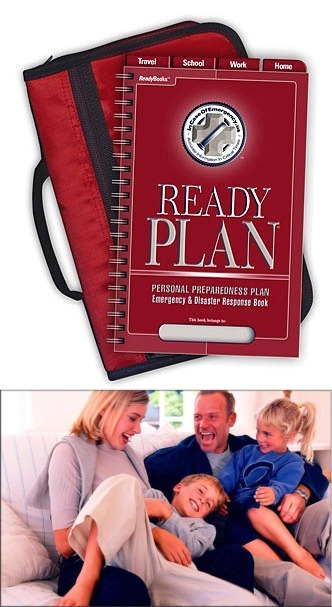 is one of 5 unique Emergency Response Books in the ReadyBooks™ Series. It is a unique approach to creating and maintaining your own personal medical history in a simple, organized fashion to both minimize medical errors and keep you safer. Keeping accurate and up-to-date records is crucial to good healthcare management and doctor/patient communication. 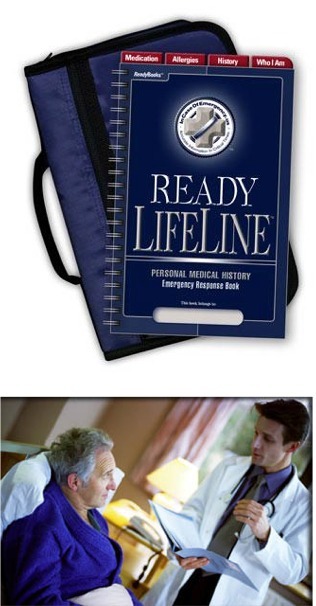 ReadyLifeline™ has been uniquely formatted with the help of RN's, Doctors and Paramedics to give them quick access to the critical information necessary for them to make accurate and informed decisions about your personal health needs in emergency situations. Whether at home or traveling, ReadyLifeline™ is an incredible communications tool between you, your doctor and medical emergency personnel. This case not only serves as a protective book cover, but also has a zippered outer pocket to store important items like medical I.D. Cards, records, receipts, glasses or extra medication and a first-aid kit when travelling. Assists you with creating personalized emergency & disaster plans that can be coordinated with other household members who also have a ReadyPlan™. You can't predict disasters or emergencies, but ReadyPlan™ can help you be prepared to manage them. Emergency information combined with extensive personal and household contacts allow you to effectively customize emergency plans for Home, Work, School and Travel. Extensive Resource & Contacts Section for city, state, federal and national organizations helps you find vital information on emergencies and disasters that are most likely to occur in your area. This case not only serves as a protective book cover, but also has a zippered outer pocket to store important items like I.D. 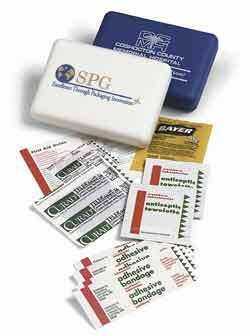 Cards, maps, records, receipts, glasses or extra medication and a first-aid kit when traveling. Note: This website uses a secure server with SSL encryption for security. The information you provide to AA Communications, including your credit-card number, is protected by encryption, so it cannot be read as it is transmitted over the Internet. The encrypted data is transmitted using a secure socket layer (SSL) connection. AA Communications will not use any of your information such as your email address and sell it to other companies. We will make every effort to remedy any problems that may arise. Due to mandated health codes, food and water items are non-returnable. If necessary, we will substitute an item of equal or greater value when that item is unavailable from our suppliers.